Let’s first estimate the change in the different markets, February 2012 to the present, to ballpark what the unimproved loft would have been worth in the current market. The too-new-for-me-to-have-processed-yet market index unveiled quietly by StreetEasy last week has a Manhattan Index value denominated in dollars from February 2012 of $733,832 compared to $936,683 at the end of the Second Quarter (per the Market Report, as the friggin’ table in the Index link is not very usable when the red line crosses the green line … sigh), for a Manhattan market appreciation of about 28%. That ballparks the loft as worth about $1.5mm today if it hadn’t been changed in between. 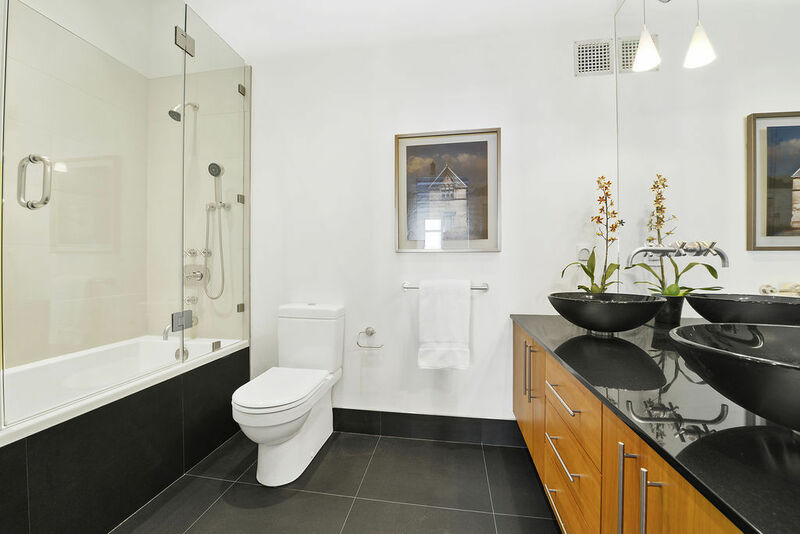 Might the 2012-buyer-turned-2015-seller have created a “stunning modern renovation” for under $500,000? If so, he generated more value by doing the renovation than he spent to “create the home of your[!] dreams”; if not, well then he got the benefit of living in your dreams, an outsider’s views of ‘profit’ notwithstanding. Kitchen by Leicht features a Liebherr Refrigerator, Miele stove and dishwasher, and a wine refrigerator. …. 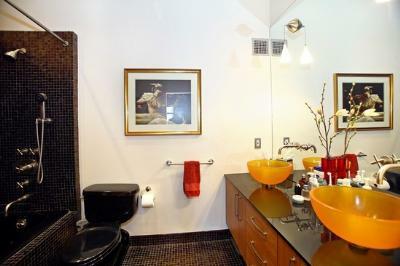 Italian porcelain bathroom with double sinks, Zuma soaking tub, and Dornbracht fixtures. California Closets plus custom built-ins provide great storage. Miele Washer and externally vented Dryer in unit. 7 wide plank white oak floors throughout, with light fixtures by Flos, Foscarini, and George Nelson. cook’s kitchen … artistically designed home is a true gem. Custom resin counter tops and appointments throughout. The maple and cherry custom kitchen cabinets are fitted with Bendheim glass panels adding warmth and a luxurious touch. The same woods have been laid on both the foyer and bedroom floors with custom maple cabinetry in the bedroom carrying through. The washer/dryer is vented. I will leave it to you to toggle between the two floor plans (then, and now), but having done it a few times I can assure you that the only evident change in layout was the placement of closets to the left of the entry. Net-net, there’s a new fancy pants kitchen replacing the former fancy pants kitchen, new flooring, and a different black and white bathroom (quite possibly, with the same bathroom vanity and sink faucets, oddly enough [then, now]). And a new paint job. So I guess the guy could have done this well under $500,000. Nicely played, sir; nicely played. At $1,674/ft for the renovated (probably re-renovated) loft #5B with no true bedroom, the much larger but virtually contemporaneous sale of loft #4G with one true bedroom at $1,379/ft is a fascinating contrast, the sort of contrast loft lovers are used to. 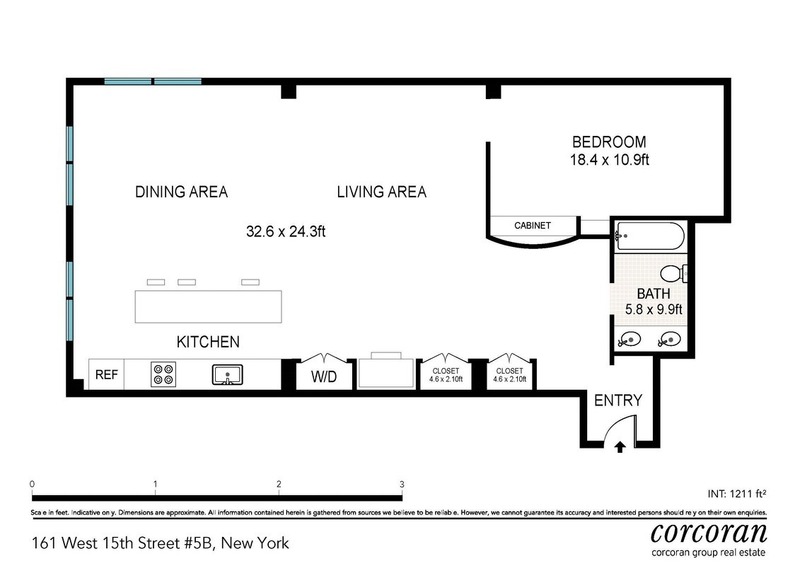 Loft #4G is nearly twice as large (“2,030 sq ft”) and was babbled as presenting a “professionally-equipped kitchen”. That one boasted “open city views and miles of sky”, with two exposures. Also vaulted ceilings, for those of us who drool over such things. Loft #4G overlapped on the market with loft #5B for the three weeks it took #5B to find a contract, but they are of such different scale that they didn’t really compete with each other. These differences allowed, the smaller loft sold at a premium of 22% on a dollar-per-foot basis. The #5B guy wins again. 1 Pings/Trackbacks for "from $1.15mm in 2012 to $1.975mm, so we have to play Guess The Budget for 161 West 15 Street loft"